The Audi A7 ranks high on the list of top luxury cars. Satisfied owners drive the car's popularity. The technology features definitely give the vehicle's ratings a boost. The high-tech components do make driving the Audi A7 interesting. Audi Connect delivers unique tech integration benefits that support driver access to information. Check out everything from traffic details to weather conditions. You can even access Google Earth from the system. Passengers may take advantage of Wi-Fi in the car. 4G LTE ensures a stable Wi-Fi signal. The Heads-Up Display places digital driving information right on the windshield. This way, drivers do not need to look down from the road. Warning displays can be placed on the display, which may appeal to safety-first drivers. Unique mirrors support the display system. Visit our showroom at Audi Stevens Creek to take part in an exciting test drive. 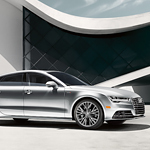 Give the Audi A7 a little test drive in the local San Jose vicinity.